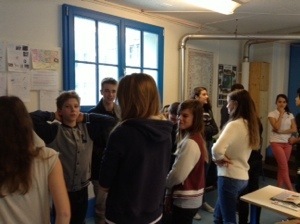 Here you can see the 4eme giving their opinion on saying the pledge of allegiance every morning. As you can see, they give their view by speaking and standing too! I’d go along with that. That’s not the same thing at all. I’m afraid I have to disagree. I must take issue with you on that.